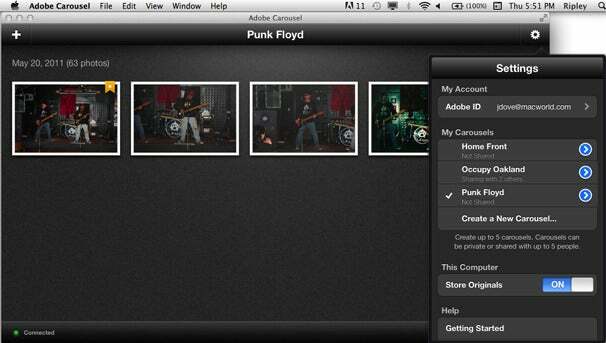 There's something appealing about Adobe's tri-partite Carousel photo management service. This easy-to-use image editor combos as a photo shooting, sharing, and syncing tool that lets you automatically back up, store, and share your photo collection via the cloud. Adobe has been experimenting with a number of software packages in an effort to achieve the easiest, most intuitive way for people to access, edit, and share photos: Photoshop Express ( ) for mobile devices and the new Photoshop Elements 10 ( ) also emphasize photo sharing and social networking. Carousel is the company's newest and most evolved consumer-oriented effort so far. 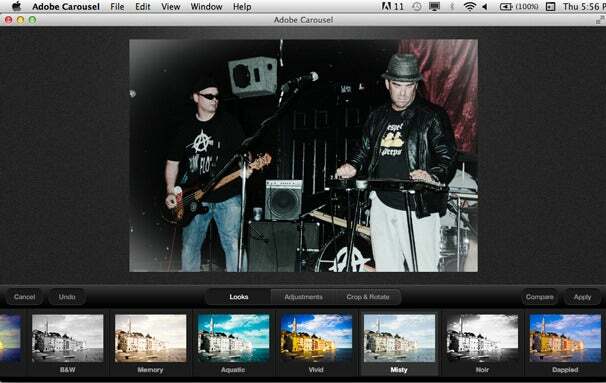 It offers a broader range of editing functionality than Photoshop Express. But, unlike Photoshop Express, which is free, Carousel was introduced as a $60 per year subscription service whose price is due to rise to $100 per year at the end of January 2012. Carousel 1.0, whose technological underpinnings are derived from Adobe's pro-level Lightroom photo management app, features three distinct but interconnected programs: one for the Mac; one for the iPad; and one for the iPhone/iPod touch. Don't let the Lightroom connection throw you: Carousel is a consumer app through and through. While you get unlimited storage and access to as many photos as you want, this 1.0 version handles only JPEGs (not RAW or even PNG formats), which eliminates most potential for serious professional use for the time being. Whenever you import a new photo into Carousel—whether you shoot it from your phone or iPad or import it from your camera card or camera roll—it appears very quickly—if not instantaneously—on all of your devices without further input from you. However, because the software is cloud-based, anything that you do in Carousel, from viewing to editing, requires a network connection. 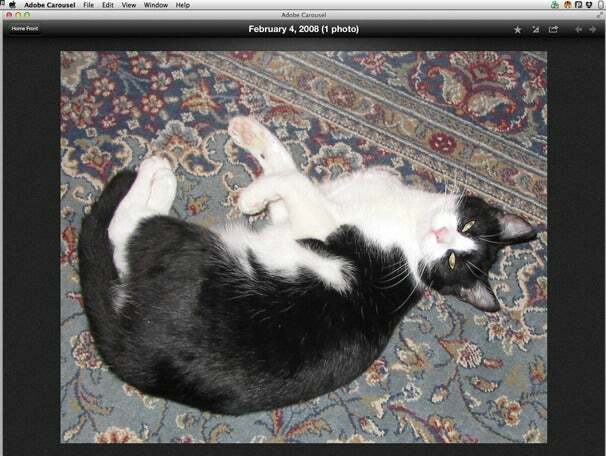 Carousel keeps a local copy of all photo files on your Mac. Originals are also replicated to Adobe servers in the cloud. While the thumbnails and images are displayed in screen resolution, in order to edit a photo, Carousel will download the original high-resolution version from its server. That might take some time on a slow network, but I did not experience significant delays in my testing. The Carousel trio of apps presents users with roughly analogous interfaces and a range of common editing capabilities. There's a slightly different interface for the desktop version, in that command icons are at the top of the window. The iPad version has a simple Develop button at the bottom of the screen, while the iPhone app, which you must unfortunately use in Portrait orientation, has major command icons lined up at the bottom. The image editing module has three main sections—Looks, Adjustments, and Crop & Rotate—listed in tab format at the lower third of the window. Each tab also has its own Cancel, Undo, Compare, and Apply buttons, along with additional controls. Looks are actually stylized presets, much like Instagram or similar iOS apps, designed to impart a particular ambience to your images. There are 17 different Looks ranging from Normal to Aquatic to Dappled. Click on a Look, and it is immediately applied to the image; the Compare button lets you toggle back and forth from the original. If you don't like the effect, try another. 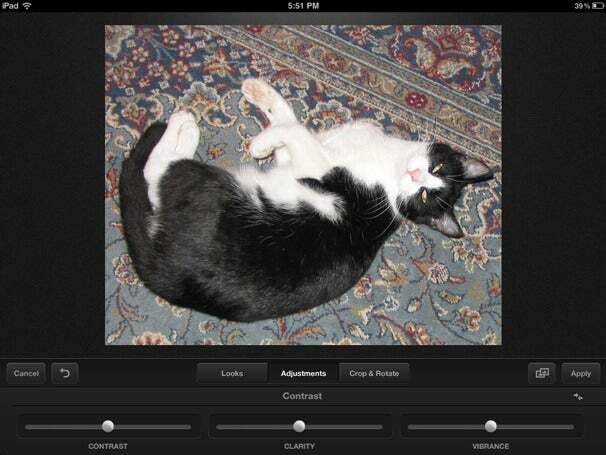 Within the Adjustments tab, sliders let you tweak white balance, exposure, and contrast. Two little arrows at the upper right of each tab module expose additional controls for temperature and tint, exposure, highlights, and shadows, and rotate, straighten, and flip edits. The image does not change unless you tap the Apply button. All edits are non-destructive, so you can always revert to your original picture. It's trial and error to figure out which Look works with your image. I used the Misty look, which gave this high-key photo a muted, grungy quality. Editing in Carousel is rewarding. You get real-time previews of the slider controls with the mouse or your fingertips. On the Mac, you can edit within the Carousel application window, but you can also operate in full-screen mode. However, you'll need the Lion OS to use Carousel on your Mac. The syncing function of Carousel worked beautifully. Without fail, any photo that I imported into the program from any location turned up on all my devices in short order. Similarly, when I removed photos from the Carousel, almost immediately those images were gone. Everything you do on one platform translates to the others. So, if you edit a picture on the iPad, the changes automatically show up on the desktop and the iPhone. If you star something as a favorite on the iPhone, it shows up as a favorite on the iPad and your desktop. But, unless you export that edited version, it will not be permanently saved or stored. That will only be an issue if you decide not to subscribe or end your Carousel subscription. So if there's an edit you want to keep, be sure to export it. Unfortunately, you can see only one Carousel at a time. When I created a second carousel from my phone, it did not automatically turn up on the screen as I expected. I had to click the gear icon at the upper right corner of the screen to get the drop down menu that makes it available, and then choose it from the Settings pane before it I could view it. As the Carousel owner, it would be nice to have an entire library view. You must use the settings pane to switch Carousel views. Sharing Carousels with non-users isn’t as quick or easy as sharing a Flickr or Picasa URL. Each subscriber gets five Carousels and can share each with five people, whether they are paying subscribers or not. And since Carousel is a Mac-only program (Windows and Android versions are due out early next year), buddies on other platforms benefit today only if they have an iPhone or an iPad. For Mac and iOS device users, the process works like this: The recipient of the Carousel gets an email inviting them to view a shared carousel, and if the recipient is a member, they can log into their free account and observe, add, and edit photos in that carousel. If they’re not a member, they must download the software and register with a password in order to use its features. Despite the high degree of motivation that would require, five seems like rather a paltry number for a service that allows an unlimited number of images. Nonetheless, you can also share individual photos via the usual social networking channels such as Twitter, Facebook, Tumblr, or via email. The editing interface on the iPad is nearly identical to the desktop version. There are numerous features in Carousel that betray its 1.0 status. 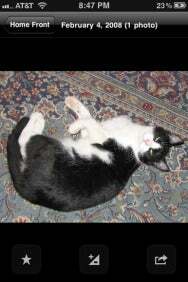 For example, photo thumbnails flow into the window in a long horizontal line on all devices. The reason is that photos in each carousel are placed as events, so that when a photo taken on a different date is imported, it will appear on a separate line. However, if you have only one set of photos taken at the same time in your carousel, then it leaves you with no choice but to scroll horizontally from start to finish. Conversely, one photo on a single date occupies an entire line by itself. It would be nice if there were a preference to use a Web-oriented interface that would line up the photos in a more natural way. Scrolling horizontally, endlessly, is not friendly. On the iPhone, Carousel only displays in portrait orientation. On the iPhone, navigation is even more counterintuitive because not only do you have to scroll horizontally, but you also have to view all photos in portrait orientation—even if they were shot horizontally. It’s not easy to move photos in and out of carousels or to batch transfer photos to different carousels. More problematically, common forms of organization such as keywords and ratings are non-existent. There's no way to batch edit photos or batch remove them. In its 1.0 incarnation, Adobe Carousel, though promising, has a way to go to appeal to a broad base of photo-oriented consumers and professionals. While its current, basic set of functions work quite well, Carousel has more of an Adobe Labs look and feel to it than a polished product. And, it's too expensive for what it currently offers. You do get a 30-day free trial, so I encourage you to try it and see whether it suits your needs before committing to a paid subscription. Carousel offers a distinctive and compelling approach to photo editing and sharing that is destined to improve over time. Adobe says it is planning upgrades to the service in response to user feedback. I look forward to a friendlier interface, more flexible photo viewing and sharing options, increased format support, and more organizational and batch functionality.